Dr. Gordon Dutt, founder and original winemaker at Sonoita Vineyards and now retired soil scientist from the University of Arizona, along with Blake Brophy established the first experimental vineyard on the Ignacio de Babocomari Ranch in Southern Arizona back in 1973. 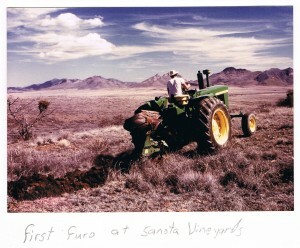 Following his experimental success, Dr. Dutt planted Arizona’s first commercial vineyard in 1979 and opened the winery in 1983. Starting with an annual production of 300 gallons, Sonoita Vineyards is now producing over 10,000 gallons per year. Overlooking 25 acres of vines, the winery is located at the top of a scenic hill three miles south of Elgin, Arizona . The varieties grown on the estate today are Sauvignon Blanc, Cabernet Sauvignon, Merlot, Pinot Noir, Mission, Sangiovese and Syrah. Thirty years after planting their first vineyard, Sonoita Vineyards continues a fine tradition of producing highly rated wines. Highlighting the flavors unique to the Sonoita Appellation, Sonoita Vineyards has gained critical acclaim for excellent wines and great values.